If you’re experiencing slow internet connection with your Globe Home Broadband, before calling their hotline you can check first your Prolink H5004NK modem or router as part of your basic troubleshooting. 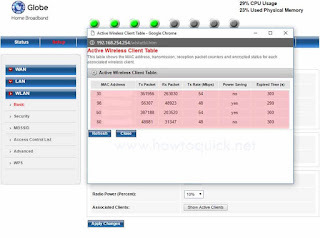 You need to know and view how many devices connected to your Wi-Fi network and for checking unauthorized access. If you found out that there are other users connecting to your wireless network, you can always do a change password or do a MAC filtering to allow and deny access to selected known device only. It’s important to know who is connected to your Wi-Fi network, especially these days as our internet providers like Globe now offers limited bandwidth monthly. Once your internet connection is up and running, the Globe technical team only provides the manual and other basic information’s like hotline number on where to call in case of trouble or problem if you encounter internet connection. Details like configuring your modem is all “do it your own” or you can also call their hotline for assistance if you don’t know the admin password to access your modem. In this basic tutorial, we’ll guide how to view devices (e.g. smartphones, tablets, laptop etc.) connected your Wi-Fi network. Type 192.168.254.254 on your browser’s address bar then hit Enter. 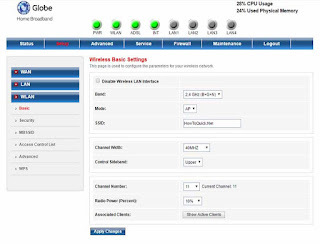 On Globe Home Broadband web interface, click on Setup to access your modem’s configuration. When prompted with authorization required, type Globe DSL default Admin Password. Click on Setup tab, then click on the WLAN tab on the left sidebar. Click on Show Active Clients to view all active connected devices. If you’re not sure whose device MAC address is listed, you can do a MAC lookup online to have an idea of what kind of device and manufacturer of the device connected to your network.